I do feel bad, at times, when I play tennis against my mates in a “Davis Cup”, given that I am the creator and holder of the cup in question (the one we play for a is a small, earthenware goblet, hand painted with the words Davis Cup). Ironically, given the heritage of my name and the fact that I have played tennis at courts all around Adelaide, the closest I have been to Memorial Drive, South Australia’s premier tennis venue, is earning a reputation for what is known as my memorial drive. This “drive” is when I turn my back to the ball and swing a low, lifting back hand winner from “memory”. The greatest string of Davis Cup titles was one that stretched for months on end at the Beulah Park courts from 1994-1998. 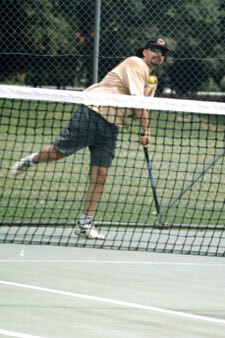 To read some facts about Tennis Raquets from another Steve Davis at this site.